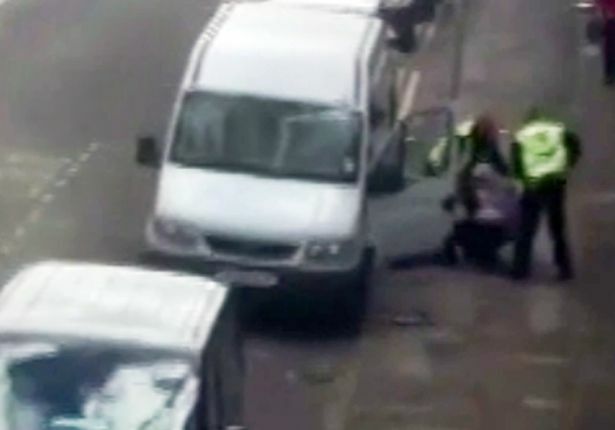 This is the moment security guards were DRAGGED along a road by a speeding getaway van after attempting to stop thieves who raided a Poundland. Shocking footage captured the moment a suspected shoplifter escaped the clutches of FIVE security guards before speeding away with an accomplice in a white transit van. Two guards were left injured in the tussle, with one thrown to the ground by the van as it made off from Chelmsley Wood Shopping Centre . The incident unfolded at around 1pm on Wednesday and was captured on camera by a concerned eyewitness. It is understood the crooks had been chased from discount shop Poundland, inside the Maple Walk shopping centre. The horrifying footage shows stricken shoppers watching as security guards wrestle a man to the ground outside the centre. One eyewitness told the Birmingham Mail: “Security and a male were involved. “A van sped off, taking security with them and one hit the floor. The footage, which lasts almost two minutes, begins as two security guards wrestle a man to the floor, next to a white transit van. It is thought one man had already got into the van. Around 30 seconds into the video, another three security guards run towards the scene. But the man on the ground manages to escape the guards and climb into the van as it speeds away, with the door wide open. Two of the guards are still leaning into the passenger side as the van makes off and one is thrown to the ground. Police have confirmed two security guards suffered injuries in the incident. They are continuing to investigate. A West Midlands Police spokesman said: “We were called to Chelmsley Wood Shopping Centre at around 1pm. “Two security guards have chased suspected shoplifters from Poundland. “Two men have got into a white transit van and driven off. “The security guards have been dragged along the road for a short distance while trying to detain the suspects and suffered minor injuries.